Kiss– verb (used with object) 1. to touch or press with the lips slightly pursed, and then often to part them and to emit a smacking sound, in an expression of affection, love, greeting, reverence, etc. : He kissed his son on the cheek. This singular verse (v. 49) should cause us to pause and think. It is part of an amazing account of the events surrounding the death of Jesus. At this point Judas leans over and kisses him. Now, a kiss can be used when you show affection and commitment for someone. Kisses are like a ‘x-ray’ into your very being, opening and quite revealing. Judas shows everyone exactly what he is all about. The kisser declares to the kissed the intent and desire of their heart. It also says things to those who witness it. This kiss of Judas set into motion a whole series of events. But more importantly, this kiss was an evil kiss. We kiss and are kissed. Its the way we tell others of our friendship and fidelity. It has always been so. The mechanics of it all seem a bit odd, when you think about it. Touching lips? (Ok. That’s odd.) But a real kiss goes further, injecting love and esteem and other intangibles into another. Also, we should understand that a kiss has intense power. The kiss of Judas had this power. It wasn’t done to convey his commitment or affection, rather it was a powerful act of betrayal. 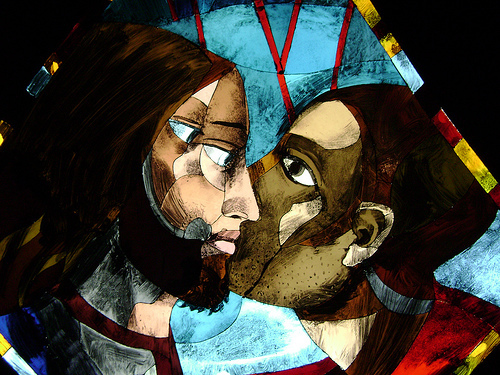 Judas had drained this particular kiss of all its goodness and only evil remained. A “Judas kiss” is perhaps the most dastardly way one can be betrayed. It is not real common, but it happens, and it is devastating. Some have told me that it was like having your heart ripped out of your body. Betrayal with a “Judas kiss” is almost always a surprise, coming out of the blue, hitting you when you’re most vulnerable. We must not be surprised if some bad men enter the Church, for even among the twelve was one Judas. It is no proof that Christianity is untrue when some of its believers prove hypocrites. The defection of Judas did not leave a stain on the name of Christ, nor did it disprove the loyalty and fidelity of the other disciples. One may be very near to Christ and not be made holy in character. Judas was three years with Christ, heard His words, lived in the atmosphere of His love, and remained unchanged. An empty bottle, hermetically sealed, may lie long in the ocean and continue perfectly dry within. A heart sealed to Christ’s love may lie near Him for years and not be blessed. Only when the heart is opened to receive His grace does closeness to Him change the heart. Sin grows, and we never can know to what terrible and awful extent a wicked thought or desire may reach. Extrapolated, it has a vast magnitude of evil possibilities and potentialities beyond anything we would have ever dreamed. Our actions can bless God, and others immensely. We really have no idea that we have such power in our grasp. But we do say and do things that do alter the realities of those who are trying desperately to draw close to Him. We like to be unattached from these very real things. We suppose that it is a “no-brainer,” we will always avoid any complications or entanglements, about our behavior. However, reality is much more “unforgiving” then we imagine. How we conduct ourselves is certain, and is significant. Honestly, when we become believers and are added to His church, can we honestly behave worse than we were before our salvation from sin? I’m truly convinced of this. 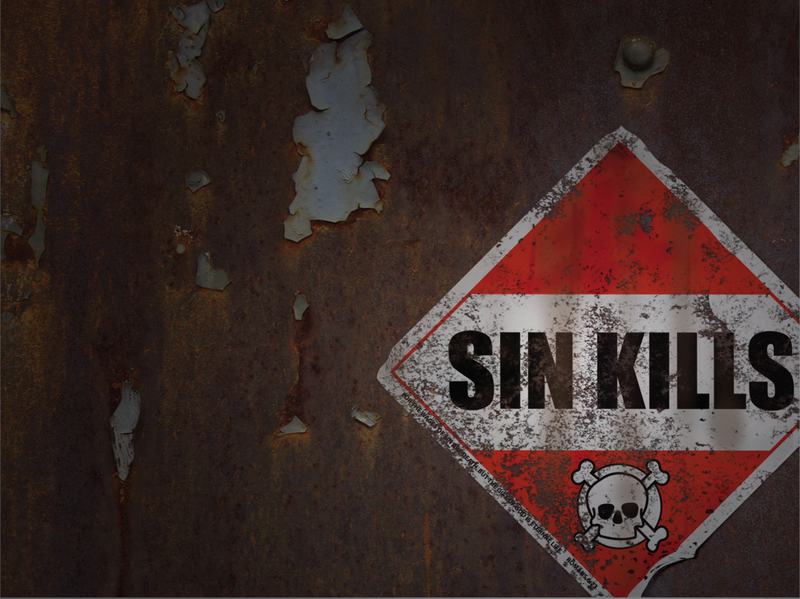 Our decision to keep enjoying sin is disturbing. Our “death” in this case, has never happened. We have died to nothing, and remain untouched by the Gospel. We become just inoculated enough to make us believe that we are “ok.” Our lives keep moving, and we will never consider that we have made these wrong adjustments. Are we not “offending Jesus Christ” by not dying to our own sins? If we have pretty much remained the same kind of people, then it is very likely we have. Our enjoyment of sin indicates our real allegiance that we will have when “push comes to shove.” It really seems that we must shake off the old way before we can put on the new. I simply suggest that you liaten to the Spirit as you make your choices. Let him accompany you and show you what offends. I only speak boldly, because it matters more than you realize.